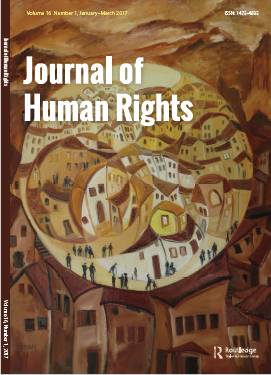 The Journal of Human Rights seeks to broaden the study of human rights by fostering the critical re-examination of existing approaches to human rights, as well as developing new perspectives on the theory and practice of human rights. The journal aims to meet a globally growing interest in the study and practice of human rights by serving as an arena for the public discussion and scholarly analysis of human rights, broadly conceived. Because the Journal is committed to theoretical and ideological diversity in the study of human rights, the editor welcomes papers from scholars and disciplines traditionally associated with the study of human rights as well as papers from those in other disciplines or fields of inquiry which have traditionally been under-represented in the field. We also welcome ideas for special issues, symposia, and reviews from scholars and practitioners of human rights. For more information, to download articles, subscribe, or peruse past issues, please visit our official Taylor & Francis Homepage. With issue 15.2, JHR introduces a new tool aimed at advancing quantitative human rights scholarship: the launch of an online portal (hosted through Harvard Dataverse) featuring all datasets associated with articles of this nature published in JHR. Dr. Benjamin Carbonetti (former Managing Editor, JHR and now data consultant to the journal) explains the origins of this project along with JHR’s new policy requiring authors who employ quantitative data and regression modeling techniques in their articles to also submit a replication file and description of the data to portal. You can access the Dataverse site here: https://dataverse.harvard.edu/dataverse/jhr, and you can read more about this exciting new development in Carbonetti’s piece “Research data and methods policy update for the Journal of Human Rights,” freely available here. Notably, these changes do not affect the submission of qualitatively-oriented work and JHR indeed remains committed to maintaining the interdisciplinary and mixed-methods nature of the journal as well as to encouraging scholarly collaboration across fields, approaches and policy areas. In conjunction with the 2018 American Political Science Association conference, the Journal of Human Rights has compiled an Editor’s Choice article collection focusing on this year’s conference theme, Democracy and its Discontents. Enjoy free access to the articles until 31 October 2018. Read Shareen Hertel's piece, "Taking Action in Challenging Times for Human Rights."